"Igor" is about a misunderstood hunchback and an aspiring actress, and it's easy to see why it got made in the first place: Most of the men who run Hollywood envision their world in roughly the same terms. Screenwriter Chris McKenna -- whose chief credit is the Fox series "American Dad!" -- brings a classic supporting horror-movie player center stage, the way the "Shrek" movies subverted and showcased the ogre archetype. In the Kingdom of Malaria, Igors are sent to Igor School for a "Yes Masters' Degree" (I like that bit), destined for a servile, lisping, foot-dragging existence in the employ of the country's many evil scientists. 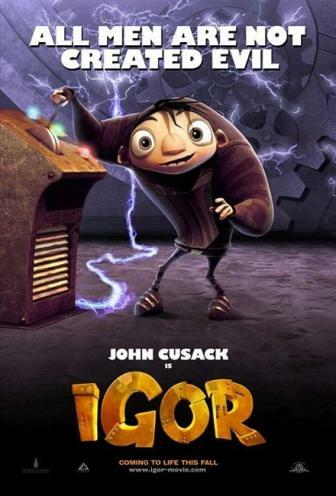 The Igor "Igor" concerns itself with is voiced by John Cusack. His venal boss, Dr. Glickenstein (John Cleese), expires while tinkering with his invention for the annual Evil Science Fair, leaving Igor to freely experiment with his own creation: a destructive force of mayhem, female division, voiced by Molly Shannon. She recalls Elsa Lancaster in "The Bride of Frankenstein," without the electro-fro. The gag here is that "Eva" isn't evil in the least. Subjected to a "Clockwork Orange"-style brainwashing process, she is mistakenly shown a James Lipton "Inside the Actors Studio" program and comes out thinking she's an actress herself, obsessed with scene study and updating her "sense-memory journal." If this sounds rather arch, well, a lot of "Igor" certainly is that. You'll surely never see, or hear, a more menacing rendition of the "Annie" anthem "Tomorrow" than the one sung by the newly evil-ized Eva as she batters the competition at the climactic Evil Science Fair. I don't like that scene much: It's just off-putting. More fun for me, as well as for my preteen son John and his pal Liam, is the running gag with Igor's associate, the suicidal rabbit Scamper. With an uneven and overstuffed script you appreciate the corner-of-the-mouth comments as delivered by Steve Buscemi. The boys' favorite bit was one of the simplest: "May I suggest that you look behind you!?!" Scamper thunders, after Eva's gone missing. Igor looks. Nothing there. "It was just a suggestion," he says. The visual universe of "Igor" is pretty grim, full of rusty maroon tones and belching smoke and pop decadence. Director Tony Leondis and his chief art director, Olivier Besson, are trying to show us there's more than one way to evoke moods and textures made famous by Tim Burton. Even with various script doctors, "Igor" isn't particularly funny, and having all those Louis Prima tunes on the soundtrack seems completely at odds with composer Patrick Doyle's moody, sardonic orchestral commentary. But my kid went with it, and I had a fairly good time with it, as I waited patiently for the reappearance of a marble-mouthed peasant tart, Mittel-European division, voiced by Jennifer Coolidge. Half the time her line readings are hilarious, and it's impossible to know, in any rational sense, why. That's my kind of voice artist. MPAA rating: PG (for some thematic elements, scary images, action and mild language). Starring the voices of: John Cusack (Igor); Steve Buscemi (Scamper); John Cleese (Dr. Glickenstein); Jennifer Coolidge (Jaclyn/Heidi); Arsenio Hall (Carl Cristall); Sean Hayes (Brain); Eddie Izzard (Dr. Schadenfreude); Jay Leno (King Malbert); Molly Shannon (Eva). Directed by Tony Leondis; written by Chris McKenna, additional material by Leondis, John Hoffman and Dimitri Toscas; art directed by Olivier Besson; animation supervised by Christele Jolens and Yoshimichi Tamura; edited by Herve Schneid; music by Patrick Doyle; produced by John D. Eraklis and Max Howard. An MGM release. In a land of mad scientists and diabolical inventions, what do you do when you're born with a hunch on your back? A hilarious twist on the classic monster movie, IGOR tells the story of one Igor who's sick of being a lowly lab assistant with a Yes Masters' degree and dreams of becoming a scientist. When his cruel master kicks the bucket a week before the annual Evil Science Fair, Igor finally gets his chance. With the help of two of his experimental creations - Brain, a brain in a jar who's a little light on brains, and Scamper, a cynical bunny brought back from being road kill, Igor embarks on building the most evil invention of all time, a huge, ferocious monster. Unfortunately, instead of turning out evil, the monster turns out as Eva, a giant aspiring actress who wouldn't hurt a fly. Just when the load on his back can't get any heavier, Igor and his band of monstrous misfits uncover an evil plot that threatens their world. Now, they must fight to save it and prove that heroes come in all shapes and sizes. Featuring the voice talents of John Cusack, Steve Buscemi, John Cleese, Jennifer Coolidge, Arsenio Hall, Sean Hayes, Eddie Izzard, Jay Leno, James Lipton, Molly Shannon and Christian Slater, IGOR is the must-see family comedy of the fall. Metro-Goldwyn-Mayer Pictures Presents an Exodus Film Group Production, IGOR. Directed by Tony Leondis. Written by Chris McKenna. Produced by John D. Eraklis and Max Howard. Executive Producer Jean-Luc De Fanti. Line Producer John McKenna. Music by Patrick Doyle. Credits are not final and subject to change. IGOR is rated PG by the Motion Picture Association of America for Some Thematic Elements, Scary Images, Action and Mild Language. The film will be released in theaters nationwide on September 19, 2008. In the Kingdom of Malaria evil is good business. Each year the kingdom hosts an Evil Science Fair showcasing the diabolical Evil Inventions that Malaria's thirteen evil scientists have spent the year creating. King Malbert, Malaria's leader, then kindly informs the rest of the world that the winning Evil Invention will be unleashed on them unless they cough up an exorbitant amount of money. So the world pays and Malaria prospers. But it wasn't always this way. Once a bright and happy place of fertile fields, Malaria was plunged into darkness when strange clouds moved in and never left, eventually causing the crops to die and Malaria's citizens to lose hope. However, the business of Evil brought prosperity back to the kingdom, and the Evil Scientists who annually battle each other to produce the winning invention are Malaria's most prominent citizens. And then there are the Evil Scientist's trusty lab assistants - also known as Igor's. In Malaria if you're born with a hump on your back you have only one choice - you are sent to Igor School to train for a Yes Masters' Degree and a life of servitude as a lab assistant to one of Malaria's Evil Scientists. But one Igor, dissatisfied with living as a slave to his master, Dr. Glickentstein, dares to dream of becoming an Evil Scientist himself and reaping everything that goes with it - the fame, the fortune, and of course the girl. When fate steps in, and Dr. Glickenstein accidentally gets on the wrong side of his own invention, bringing about his own end, Igor seizes his chance and sets out to make his dream come true. Concealing his master's demise, and with the help of his own secret experimental creations - Brain, a not so bright brain-in-a-jar, and Scamper, a rabbit with a death wish, who despite his best efforts just can't die, Igor sets out to build the most evil invention ever - a huge, ferocious Monster, designed to reign terror upon all in its path. Unfortunately, Brain's well meaning but somewhat inept assistance causes something to go awry and Igor's evil monster turns out to be a "she" and, unfortunately for Igor, the sweetest thing in the world. Misunderstanding Igor as he attempts to convince her that she is evil, the Monster calls herself Eva and, to Igor's further despair, announces that she wants nothing more than to be an actress. With only a week before the Evil Science Fair, Igor is determined to find a way to turn his Monster into the weapon of destruction he intended, and so appealing to Eva's dreams of stardom he tells her that they must immediately begin rehearsals preparing her to audition for a role in a big musical that requires her to 'act' evil. Proclaiming herself up for the part, Eva throws herself into the evil "rehearsals" with her new friends. As rehearsals progress, Igor - to his horror - begins to fall in love with the big hearted monster, and comes to the realization that being an evil scientist is a whole lot tougher than he had imagined. To make matters worse, Malaria's reigning Evil Scientist, Dr. Schadenfreude, has discovered Eva and is determined to steal her. A conniving cheater, who year after year manages to win the Science Fair by stealing ideas from other evil scientists, Schadenfreude has decided that this year in addition to claiming the winning invention he is going to take over the throne from King Malbert - and the Monster is going to help him. With the help of his ruthless girlfriend Jaclyn, Schadenfreude sends Igor down the Igor Recycling Chute and steals Eva, determined to complete her evil programming and fulfill his ruthless plan to rule over Malaria. With his creation stolen and dream of becoming an evil scientist destroyed, Igor is resigned to his fate of the recycling chute, when, defying even their own expectations, Scamper and Brain manage to come to his rescue. Convincing Igor that he can't give up on his dream yet, the trio set off for the Science Fair to win Eva back, but when Igor uncovers a plot that threatens to destroy their world, he has to prove that heroes come in all shapes and sizes and show Malaria - and Eva - that some dreams are worth pursuing.